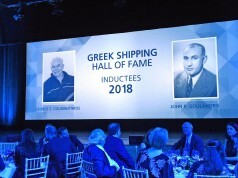 The ceremony took place at the Athenaeum Intercontinental Hotel on October 23rd, 2012, among 850 members of the maritime community and a great number of distinguished guests. 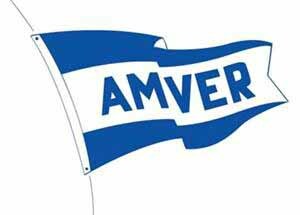 One Hundred and Forty four (144) Greek controlled shipping companies received 1.066 awards on behalf of 1.066 vessels participating in the AMVER System. 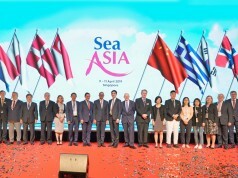 Minister of Shipping, Maritime Affairs and the Aegean, Mr. Konstantinos Moussouroulis welcomed the audience and referred to the contribution of the AMVER System regarding provision of rescue and support to vessels and crew in danger as well as the contribution of the Greek controlled vessels. He noted that the number of companies participating and vessels’ response to the system has comparatively risen the last year. 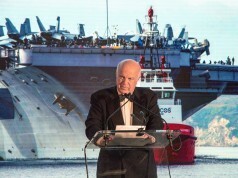 He also mentioned that now there is a new Maritime policy in Greece under the new Ministry of Mercantile Marine in order to bring more ships under Greek flag. The President of the Propeller Club, Mr. Antonios Stamos Faraklas welcomed the attending guests. The President remarked the importance of the AMVER System by stating that it is ‘…the only program designed and working for mariners to help mariners in the time of ultimate need irrespective of nationality, religion, etc. and which could not have been possible to operate as efficiently as it does without the involvement of the United States Coast Guard’. Secretary General, Mr. Theodoros Kontes, Ceremony coordinator, invited the United States Ambassador to Greece, D. B. Smith who also emphasized the importance of the AMVER Program with Greek companies to be in the top of worldwide lists. The representative of United States Coast Guard, Vice Admiral Peter Neffenger, Deputy Commandant for Operations, USCG welcomed the audience and referred to the Greek maritime contribution and referred to the rescue case of M/V Navarino of Costamare Shipping. The Ceremony of the AMVER Awards continued with Governor John Kalafatides who called on stage Minister Mr. Moussouroulis AMVER Awards to present the first awards. Following awards were presented by Ambassador Daniel Bennett Smith, Mayor of Piraeus Mr. Michaloliakos Vasileios, Commandant, Vice Admiral of Hellenic Coast Guard Bantias Dimitris, Vice Admiral, Peter Neffenger, U. S. Coast Guard Deputy Commandant for Operations. 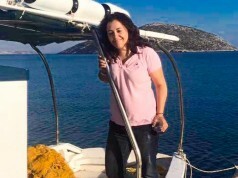 Mrs. Despina Foros-Tsirozidis, 2nd Vice President of the Propeller Club, called all gold sponsor supporters included, Mr. Hadjieleftheriades, Tsakos Group of Companies, Mr. Houliarakis Dimitrios ABS, Piraeus, to present awards, Mr. Tsiftsis, Nippon Kaiji Kyokai (ClassNK). Following Mr. Kontes presented the ‘Propeller Club Special Rescue Awards’ which were given by the Mr. Faraklas. Awarded were Captain Mayrogiannis Dionysios and the Crew of the fishing boat ‘CAPTAIN DIONYSIS’, to Captain Athanasios Pagkalos and the Crew of M/V NAVARINO of COSTAMARE Shipping Co and to Captain Rafael G. DIONGSON and the Crew of M/V SEA FORTUNE of ATHENIAN SHIPMANAGEMENT Inc. Prior serving the Gala Dinner past Propeller Club President, Cpt. 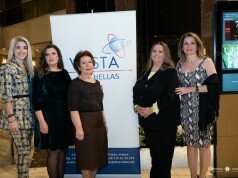 Savas Kalafatides, closed the Ceremony announcing the Containerization Conference which is planned to be arranged by the International Propeller Club of Piraeus within 2013. Representatives of International Registries, Chugoku Marine Paints (Hellas) S.A., Marichem-Marigases Worldwide Services, EPSILON, Hellas, Mr. Ventouris from Capital Maritime, Delta Sky, Fafalios Shipping, , members and friends of the Propeller Club.